I did videos every single day for 2 weeks in December and as a result, got several new 1-on-1 clients (all cold traffic) and a bunch of new leads -- without doing a free call, collecting email addresses or even creating a landing page to promote it. December is known as a DEAD month for most businesses but things were on an upswing and it was because of my daily videos. I didn’t gain hundreds of new followers but I made money that came DIRECTLY from instagram which I hadn’t done before -- most of my money comes from my list. One of the things to know about social media -- and instagram in particular, is that you have to lean in to what you do best naturally and if you don’t, instagram doesn’t really work. So basically that means that if you aren’t someone who is overly fond of curating your feed of taking really good photos, that shouldn’t be how you do instagram. I decided to go with a new approach. Each day for about 2 weeks, I created a new video about a different topic on my instagram feed. I noticed that these videos got way more interaction and started way more conversations than a perfectly curated photo ever did. Videos are especially good for woo bosses because with your type of work, people NEED to feel and experience what you do in order to really invest. In fact, my Woo Bosses are spending the next month (or two) on developing videos and content. Set the standard that these videos are just a casual conversation about their problem vs. a high-production video. It makes you seem more accessible and encourages people to interact with you while also allowing you to create more videos. The more people see you and trust your POV, the better. Don’t try to look super cute for every photo. I put on a coat of lipstick (sometimes) and that’s it. Instead of thinking of a new idea everyday, I focused on one big idea a week and created videos about them throughout the week. I would even build upon previous videos or create little mini-series. I won’t go into too much detail about how I structured the videos, I am spending a whole retreat on video scripting, but I will say that by having a theme I was easily create lots of content, without running out of ideas. Think about your clients. What are the big problems your clients tend to have? What do they ask about over and over again? While you don’t HAVE to do minute long videos, learning how to work with that format really helps because you can put your video in more places. In order to do that, you have to be really clear and focused with your message and not try to give or say too much during any of your videos. This is good practice for ALL your content and it’s really improved my writing too. A instagram video is just like any piece of content you create, people need to know what to do next. I don’t always have time to ask a question in the video but asking one in the description or in the comments is a great to make direct connection with your readers. You don’t want your video to get too distracted with lots of stuff in the background. Keep in minimal and find a place with good light. The best way to find your light is to simply turn on your camera and walk around the room until you look well-lit, close to windows or other forms of light. Natural light is ALWAYS best. 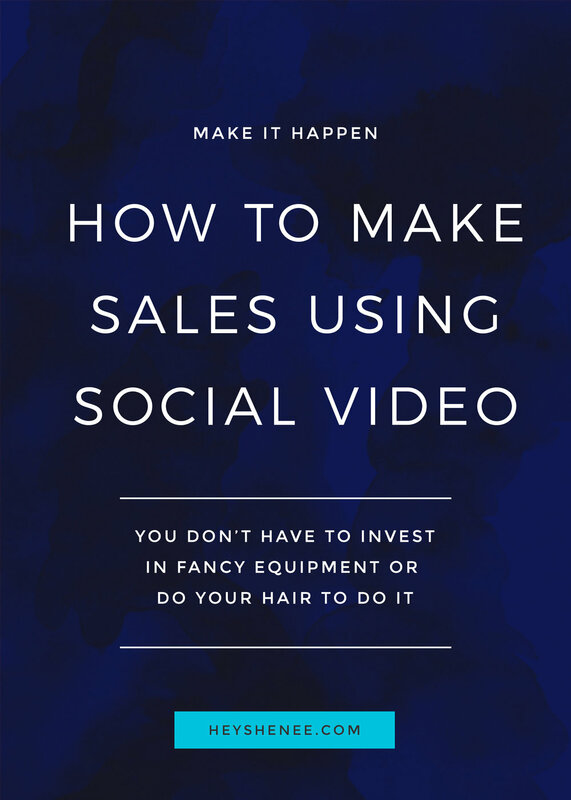 • How to make sure your videos inspire sales vs. sets you up as a free resource….there is an art to this! Get on the list to find out when the cart for something big and new coming up and it is designed to help you get more sign ups for whatever you are selling. You'll also get access of my stash of my favorite things. I’m also raising my prices AGAIN for my 1-on-1 work so if you want me to build your brand -- your message, your offerings and co-create your copy --- check out my offering here and sign up for a free discovery call before I increase my prices againMarch 1st! I know, right. That’s why I’m increasing my prices. Get me while I’m still cheap!